In the early fifteenth century the pace of ship development in the Atlantic tradition began to pick up: this was the period with the most intense development of sailing ships. I hinted earlier about the potential for ship growth (in size) and development should the northern clinker and the Mediterranean carvel designs fuse. Such a mixing began with the Crusades. Many northern knights headed for the Holy Land in their double-ended clinker-built ships, taking them into Mediterranean ports en route. Better ships led to increased trade further afield, which contributed to the mixing of ship-building ideas so that, instead of two separate strands, Europe became a melting pot of diverse ideas concerning ship design. One of the first fruits of this melding of ideas, and certainly the best-known and most successful ship of its day, was the carrack. The carrack was a carvel-built ship with a stern rudder. This combination of features permitted carracks to grow larger than their predecessors. 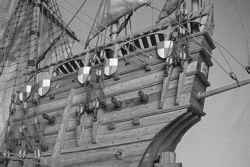 Originating in the early fourteenth century around Genoa, by the fifteenth century a typical carrack displaced 600 tons; by the sixteenth century carracks weighed in at 1,600 tons. These later carracks were typically 115 ft long with a beam of 33 ft and a depth of 17 ft. The carrack was a high-sided vessel with a stern castle and a particularly high forecastle. These castles grew into multistoried structures, giving the carrack a characteristic U-shape side on. The castles were integral to the hull and not, as earlier, appearing to be add-ons. They provided protection from the weather amidships, as well as protection from attackers. Carracks heeled rather a lot in strong winds, being somewhat top-heavy because of the castles. Their sterns were rounded, and they had a relatively deep draft: they were open ocean ships. Figure 1.9. A model characterization of a carrack, with intentionally exaggerated features. Note the high stern castle, the stern rudder and, especially, the deep draft of this archetypal Age of Exploration ship. Thanks to Slava Petrov for these images. rig sails were good at running before the wind, while the Mediterranean lateen sail permitted tacking and yielded better control. Later carracks had three masts, the new foremast being square-rigged. Bowsprits were added early on (around 1350) to the top of the forecastle, and by the mid-1400s some carracks had topsails above the main sails. Masts, consequently, grew taller. As the carrack evolved, a fourth mast, the bona-venture, was added aft of the mizzen and given a lateen sail. From 1500 CE all four masts carried topsails, and the main and fore masts carried topgallants. Thus, carracks were among the first fully rigged ships to be built (fig. 1.9). The proliferation of sails resulted in crew specialization, with some crew stationed in the rigging rather than, as earlier, with everyone working the sails from the deck. The carrack was the best Atlantic-tradition ship to date and was used for trade and war throughout Europe* and for exploration beyond Europe. The other great ship of the Age of Exploration is the caravel.§ Originating in Portugal and derived from thirteenth-century fishing boats, the caravel was adopted by most European seafaring nations by the fifteenth century, though it will always be associated with Iberian explorers. 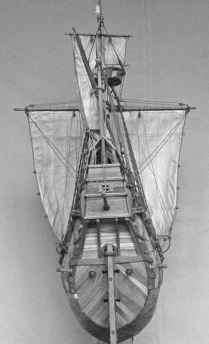 Significantly smaller than the carrack (typically 65-80 ft long, 25 ft in the beam, and 10 ft deep) and with a correspondingly smaller cargo capacity (60-100 tons), the caravel was nevertheless a successful merchantman of luxury goods such as silks and spices in the Atlantic and Indian oceans sunk, under the baleful eye of her king, off the southern coast of England in 1545. Her gun ports were too close to the waterline, and she shipped water when heeling during a maneuver. The Mary Rose was raised in 1982 and is now on public view (see bibliography). * This is the consensus view of historians, a minority of whom consider the Santa Maria to be a caravel. Certainly this ship was not a standard carrack (compare fig. 1.10 with the description of carracks in the text). tOnly 18 of the original crew of 270 completed this eventful journey. Their captain, a Portuguese in the employ of the Spanish crown, was killed en route. Nevertheless, Magellan is given credit for the first circumnavigation because he had earlier been the first person to pass through every meridian. The carrack was known as the nao to the Portuguese and Spaniards. t Clinker hulls were not well suited for piercing to make gun ports because the strength of clinker-built ships lay in the shell, not the frame. This strength was compromised by piercing the hull. §The name caravel is perhaps linked to carvel, as in "carvel-built." Figure 1.10. The Santa Maria, a carrack, was one of the three ships taken by Christopher Columbus on his first voyage to the New World. This picture seems hardly less fantastic than the model of figure 1.9. Again, the high stern is prominent. Compare the increasingly complex rigging with that of earlier ships. Image from Wikipedia. and a ship of exploration par excellence. 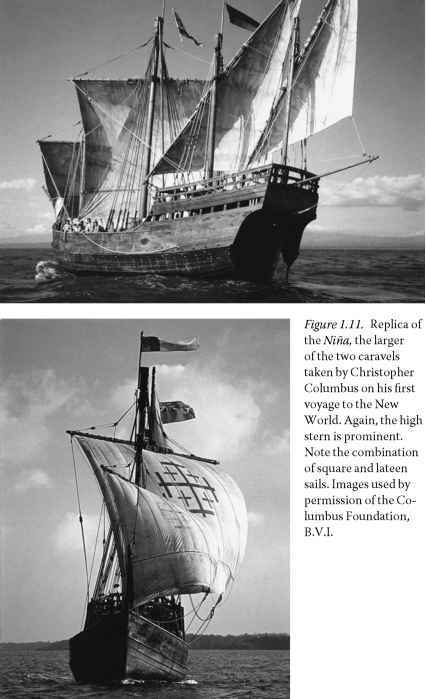 Two of Christopher Columbus's ships were caravels: the Niña (fig. 1.11) and the Pinta. The Portuguese explorers Bartolomeu Dias and Vasco da Gama were sent to the four corners of the world by their monarch, Prince Henry ''the Navigator,'' in caravels. * The caravels were also more maneuverable in tight bays and close to rocky shorelines. Of Columbus's three ships only the carrack Santa Maria foundered. tion of rigging led to different names: caravela latina if lateen-rigged for sailing closer to the wind, and caravela redonda if the fore and main masts were square-rigged for better all-round performance. The different names reflect the differing sailing characteristics and requirements of the two versions. Caravels remained the Europeans' ship of choice for open ocean exploration and trade until the end of the sixteenth century. By this time, the little caravel was just too small for the more demanding needs of a changing world. What were the top castles used for in a carrack? What was the foremast on used for on caravel ships? 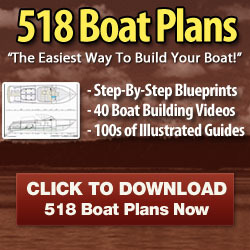 When were caravels replaced with carracks?